After Screen Australia received budget cuts in 2014, they decided to cease funding Wide Angle after 2015. It’s a big blow, but another way to look at it is that Wide Angle has been unleashed. We’ve spent the last twelve months exploring alternative revenue streams and business structures to keep Wide Angle delivering on our mission, and have come to some hard-earned conclusions about its future. 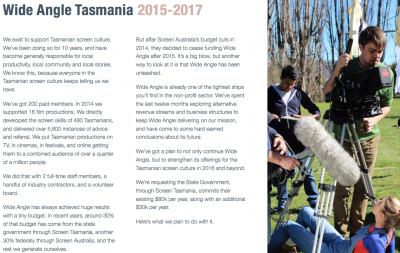 We’ve got a plan to not only continue Wide Angle, but to strengthen its offerings for the Tasmanian screen culture in 2016 and beyond. Download our vision for 2015-2017 below.